Our local markets are laden with colorful winter squash. So here at Kitchen Riffs central, that means it’s time for soup. You can dish up this soup as the starter for an elegant cold-weather dinner. Or for a main course, just serve a large bowl of soup with crusty bread or salad. It’s a whole meal. Roasting concentrates and sweetens the flavor of squash (or almost any vegetable). We like to roast the squash and peppers for this dish a day or two ahead and store them in the refrigerator until we’re ready to make soup. Acorn squash has a wonderful sweet flavor, so that’s what we used in this dish. But you can substitute any variety of winter squash you prefer. You might want to try butternut or kabocha. Or even pumpkin (yes, it’s a form of squash). Exact quantities aren’t critical for this recipe. You want about 2 pounds of cooked squash, so start with 2½ pounds, uncooked (you’ll be discarding the seeds and skin). Roasting the squash and red pepper takes an hour or so (and can be done ahead of time). When you’re ready to assemble and make the soup, allow 15 minutes for prep time and at least 45 minutes for cooking time. This recipe serves 6 to 8 as a starter. Leftovers keep for several days if refrigerated in an airtight container. Start by roasting the squash and red bell peppers (you can do this a day or two ahead of time). Heat the oven to 400 degrees F. Cut the squash in half and remove the seeds. Place the squash on a baking pan. Roast until tender (50 to 70 minutes). Allow the roasted squash to cool, then peel it. (For more detailed instructions, see our post for Winter Squash Gratin.) If you’re not planning to prepare the soup immediately, refrigerate the roasted squash in an airtight container until ready to use. Roast the red bell peppers with the squash (cook them whole, with skins on). Roast the peppers for 30 to 40 minutes (until the skin is fully charred), turning them over once or twice during roasting so they char evenly. Remove the peppers from the oven and cover them with aluminum foil. (Alternatively, you can place the peppers in a bowl and cover the bowl tightly with shrink wrap.) Let the peppers steam for about 15 minutes (this will help loosen the skin), then peel them (the skin usually slides right off). Stem the peppers, cut them into quarters, and remove the seeds and white pith. Then chop into dice of 1/2 inch or so. If you’re not planning to prepare the soup immediately, refrigerate the roasted peppers in an airtight container until ready to use. When ready to start the soup, peel the onion and cut it into dice of ½ inch or less. Heat a 4-quart soup pot on medium stovetop heat. When hot, add the oil. When the oil has heated (it’ll shimmer; this takes 15 seconds or so) add the diced onion. Season to taste with salt. Sauté the onion until it’s translucent (5 to 8 minutes). Meanwhile, peel the ginger and mince it finely. Peel the garlic and cut it into thin slices or mince it finely. Peel the potato and chop it coarsely into dice of ½ inch or so. When the onion is translucent, add the minced ginger and garlic and cook for 1 minute. Add the red pepper flakes and cook for 15 seconds. Then add the cinnamon, thyme, diced potato, and water. Add the roasted squash and red peppers from Steps 1 and 2. Bring the mixture to a slow simmer, then simmer for 45 minutes. Purée the soup to your desired thickness. You can use an immersion blender for this (make sure to use one with a metal shaft; see Notes). Alternatively, you can let the soup cool, then liquefy it in a blender or food processor. Taste the soup, then add salt and black pepper to taste. At this point, you can hold the soup on the stovetop (low heat) for an hour or so. BTW, if the soup is too thick, add a bit more water to dilute it (but remember, if you’re using cream—see next step—this will also thin it). Right before serving, stir in the cream (if using), and simmer the soup for 2 to 3 minutes. When ready to serve, dish up the soup and garnish with chopped parsley or cilantro (if using). For an alternative garnish, you could top the soup with sour cream or yogurt. Or add a sprinkling of paprika. You can substitute different spices than the ones specified, if you prefer. Fresh rosemary goes nicely in this dish. Or replace all the spices with pumpkin-pie spices. Or add some ground cumin and coriander to give the dish a more exotic flavor. We salt the onions as they sauté to help add layers of flavor as we build the soup. How much salt (and black pepper) to use in this dish? That’s highly subjective, so just add enough until it tastes good to you. If in doubt, under-season at first. You can add more at table. Potato adds some flavor to this soup, but its main purpose is to provide structure and help thicken the soup. You could replace the potato with ½ to ¾ cup of rice if you prefer (we suggest a short grain like Arborio). This soup is good without the cream, but cream adds richness and a nice mouthfeel. Use more cream if you want a thinner soup; less if you want a thicker one. BTW, you can replace the water in this recipe with stock if you want. There’s really no need, though. 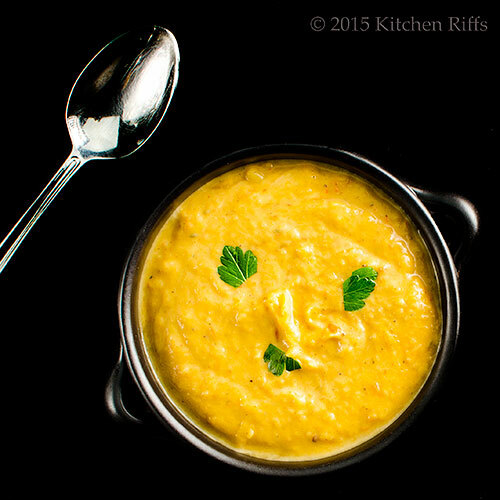 Squash has loads of flavor, and the cream adds a lot of depth. In Step 7, we suggest using an immersion blender with a metal shaft. Plastic ones can crack in hot liquid. Ask us how we know. If you don’t have an immersion blender, cook the soup through Step 7. Then let the soup cool and run it through a food processor or blender (or a food mill) to liquefy it. Then reheat the soup and add the cream right before serving. The seeds in winter squash (with the exception of a few, like pumpkin) are generally inedible, as are the skins of all winter squash. That’s why you need to peel the skin before using. The skins and seeds of summer squash are usually edible. Acorn squash is one of those winter vegetables that I just ignore. Haven't had it much, nor used it much and certainly never ever considered making a soup with it. Well that's about to change! This looks delicious and I love the sweetness of it with the acorn squash and the roasted sweet bells. That sounds SO good! 27 degrees tonight, so it's definitely soup time. Thanks John! I love squash soup just about anyway it's prepared. I like that you've added a potato for thickening the soup along with a pepper and flakes for an extra kick. I may have to change mine up a bit now to experiment. This is the perfect fall soup. Thanks for sharing! Hi MJ, we like acorn, a lot. Although we probably don't use it as often as we do butternut and other varieties. Not nearly as cold here as there, but it's still soup weather. ;-) Thanks for the comment. Hi Vicki, it's always fun to experiment with soups, isn't it? It's part of what makes cooking so much fun! Thanks for the comment. Hi Denise, this really is a pretty, cheery soup, isn't it? And its flavor is wonderful! Thanks for the comment. You're using my all-time favorite squash. I adore acorn squash and have been eating it since my weight watcher days more than 20 years ago. Lovely, lovely soup!! Hi Kristi, acorn squash is good stuff! Although I don't think there's a variety of squash we don't like. ;-) Thanks for the comment. Winter Squash is the BEST THING that has happened to the world. But seriously. It's one of the rare foods that really don't need ANYTHING added to it in order for it to taste absolutely mind blowingly good! This variety of soup is one of my top 10 favorites. I love the taste, the color and the texture. I love the nice range of seasonings from roasted red pepper to cinnamon you chose. I agree with Mrs R---the soup is souper!!!! John, sounds lovely. Winter squash = pumpkin? It's all there, John -- sweet, savory, a little kick of spice and cream, which makes everything better. :) Soup is the one thing that makes blustery fall/winterish days bearable. And snuggling. That helps too. Great recipe! It looks hearty and delicious - YUM! Pretty much craving this right now; snow = BRRRR and I want soup! Love squash in soups John; this sounds terrific. I just want to reach in the screen and take a spoon of this outrageous soup! I love Winter Squash Soup, especially if it is creamy like yours.Definitely a day for soups..raining and chilly this soup would make your day all melt into a better night. Love all the ingredients and it seems it is not that hard to make this soup. I love when you can do some of the prep work ahead of time. Thanks for sharing...yummy! Have a wonderful rest of the week! This soup has a wonderful consistency - and the color is wonderful. 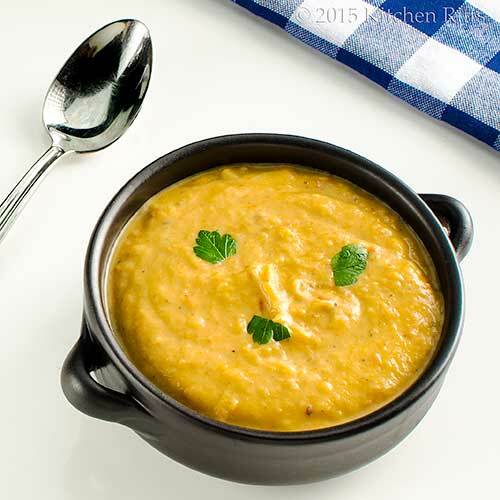 We love roasted winter squash, and soup, and immersion blenders are the best! Hi GiGi, I agree winter squash has wonderful flavor. Although it's always fun to add additional flavor. :-) Thanks for the comment. Hi Nee, it's definitely soup weather. That's what we're having for dinner tonight! Thanks for the comment. Hi Carol, it's definitely souper! The cinnamon adds a really nice touch. Thanks for the comment. Hi Lizzy, in most of the world, pumpkin is generic for any and all winter squash. In the US, pumpkin is really only used to refer to those Halloween things (and the things we use to make pie). All the other squash varieties are referred to as, well, squash. :-) We sometimes speak a different language! Thanks for the comment. Hi Judy, it's been good snuggling weather lately! And soup does help make nasty weather go away, doesn't it? Thanks for the comment. Hi Pam, it's both -- and sooo good! Thanks for the comment. Hi Barb, it's rainy, windy weather here tonight. So I'm making soup. ;-) Thanks for the comment. Hi Dottie, it's definitely soup weather here tonight -- big rain storm moving in, temperatures dropping. And I have soup on the stove. ;-) Thanks for the comment. Hi Tricia, aren't immersion blenders a genius invention? Can't live without ours! Thanks for the comment. It is freezing here today and we had our first measurable snowfall. This would taste great, but I don't want to run to the grocery! Now I have to go check the stick on my immersion blender to make sure I'm ready! Hi Abbe, I still can't believe I cracked the shaft of my immersion blender! Of course people are going to put them in hot liquid -- what was that (big, well known, international) manufacturer thinking? Anyway, soup is great at this time of the year, isn't it Thanks for the comment. Hi Shikha, yum indeed. ;-) Thanks for the comment. Hi Pat, any squash will be good in this soup, but there's something about the combo of acorn squash and cinnamon I find so appealing. Thanks for the comment. 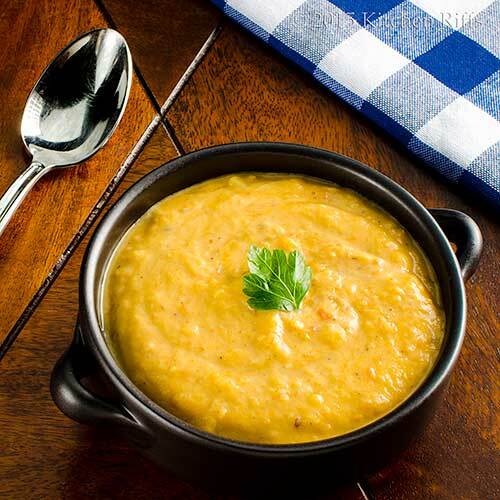 Squash soup is so versatile, just substitute the roasted peppers with some spices like cinnamon and cloves and you've got yourself a 'pumpkin pie' kind of soup! Hi Fran, this really could become a pumpkin pie soup! :-) Thanks for the comment. Yum - I love the addition of the bell pepper. Sounds amazing! This recipe is perfect for the season! Hi Alyssa, roasted bell peppers add so much flavor, don't you think? Plus a bit of color. ;-) Thanks for the comment. Hi Peachy, it is, it is! :-) Thanks for the comment. A couple of years ago I had the most wonderful butternut squash soup at a hotel here in town. It reminds me of this one with one bit exception, a splash of Frangelico. Sounds strange, but tastes so good. Maybe winter isn't going to be so bad after all. Can't wait to give this a try. Squash soups are never enough for me. This looks very comforting. Keep it coming for this cold weather. With the weather cooling, I welcome a big bowl of that beautiful soup. Could you use yogurt instead of the heavy cream in it? Hi Amira, looks great, tastes better. :-) Thanks for the comment. Hi Karen, I really like the idea of the Frangelico! Gotta give that a try. :-) Thanks for the comment. Hi Shibi, this really is comforting. And I'll be keeping it coming. :-) Thanks for the comment. Hi Carolyn, I don't see why you couldn't use yogurt instead of heavy cream! Or sour cream. Haven't done it myself, but it should work fine. Thanks for the comment. Hi John, love soup and any type of squash, looks delicious! Hi Cheri, we love soup too! Have it really often at this time of the year. And squash goes well in anything! Thanks for the comment. I made a similar soup recently, which was good, but yours looks better! I love the thick consistency! Yes roasting before hand brings such depth to the flavors! All round amazing soup John! Hi Evelyne, I just love roasted veggies! And soup. :-) Thanks for the comment. Hi Debra, it is! And so nice in cool weather. Thanks for the comment. Hi Rocquie, ginger is great in something like this, isn't it? And cinnamon and ginger is a wonderful combo! Thanks for the comment. Soups like this are my favorite year round, but especially so in winter. Love that you added some spice. Hi Laura, we're nuts about spicy food, so of course we added some. :-) Thanks for the comment. Looks terrific! I'm pretty obsessed with winter squash of all kinds and soup is always a perfect way to use them. Hi Jayanthi and Sindhiya, it is, is it. ;-) Thanks for the comment. Hi Amy, pretty easy to get obsessed with seasonal stuff, isn't it? :-) Thanks for the comment. 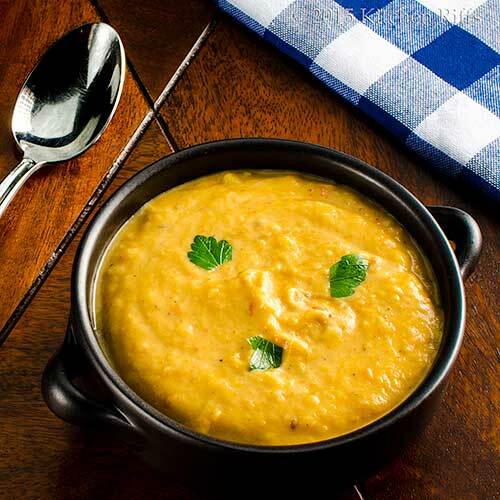 Winter squashes make delightful soups this time of year. These soups are soulful and satisfying. You soup looks fabulous. Hi Velva, winter squash soup definitely is rather soulful! Great way to describe it. :-) Thanks for the comment. Hi Charlie, I'd have thought you'd have really hot weather by now! Good thing it's still soup weather. :-) Thanks for the comment. I love the idea of using roasted squash!! I agree - the flavor when it's roasted is SO great..love the sweetness. Great recipe! Hi Ashley, this really is a fun dish -- tons and tons of flavor. :-) Thanks for the comment. It looks so rich and thick, I love the roasted flavor, too! Hi Sue, roasted stuff is really good, isn't it? Thanks for the comment. Hi Marcelle, at this time of the year, squash is always on our grocery list! Thanks for the comment. Love adding all sorts of spices to squash, sounds like a great autumn soup. Hi Caroline, spices and squash play so well together, don't they? Thanks for the comment. We haven't even gotten any cool weather lately and your soup has me wishing for a cold front to dip down our way. It sounds great. For some reason I'm thinking that cinnamon and thyme combo is a great spice for this type of soup. Looks delicious John. Hi Karen, I was just thinking about weather in Florida today -- when we were there during El Nino years, November would usually be rather cold and sometimes rainy. Guess that's not happening this time around. Thanks for the comment. Hi Lea Ann, that's a great combo, could also use cinnamon and rosemary. It's the ginger that ties it all together. ;-) Thanks for the comment. Love, love, love! I'd try this soup in a heartbeat. I love the bit of heat and spice in your squash soup! Definitely comfort food! Hi Beth, it's really good soup. :-) Thanks for the comment. Hi Liz, squash and spice just go together, don't they? Thanks for the comment. Everyone should have this soup in the repertoire. Hi Madonna, they should! :-) Thanks for the comment. Hi Lux, definitely yum-worthy. ;-) Thanks for the comment. Yummm! This looks great. I would definitely add some sweet smoked paprika at the end. Hi Traci, smoked paprika is so nice, isn't it? It'd be a great garnish with this soup! Thanks for the comment. Hi Merryn, we have one of those plastic "ricers" too -- not one of our better purchases. :-( Thanks for the comment. I go crazy for food with bright colors and your soup is for sure one of those dishes I can't stop looking at. Hopefully I can find squash soon to make this! Hi Helene, after taste, color is the most important ingredient in a dish, I think. :-) Thanks for the comment. One of the best things about winters are soups like this. Yours looks so rich, velvety and I am sure it tastes beyond amazing. I love warm hearty soups, so beautiful. I am still dreaming of the drink from your last post, so stunning. Hi Greg, roasting and squash are just made for each other! My favorite way to cook them. Thanks for the comment. Hi Asha, that drink would be a perfect predinner cocktail before this soup. ;-) Thanks for the comment. Hi Marcela, we love squash too! And this recipe is a good one. :-) Thanks for the comment. I made my first batch of squash soup this fall and loved it. I love all of the ingredients in your soup, it sounds like it would have a wonderful flavor. Hi Dawn, isn't squash soup such good stuff? And it's so fun to play with different spices and herbs when you make this! Thanks for the comment. This sounds like the perfect winter soup! Hi Raymund, it is! :-) Thanks for the comment. It's going to be 39 degrees Celsius here tomorrow, so I'm going to file this super tasty looking soup into the "try when it gets cool again" folder. Hi Amanda, this is definitely to hot for that kind of weather! Although truthfully, this soup is really good cold, too. :-) Thanks for the comment. Hi Juliana, we love roasted anything, but squash is particularly nice. Particularly in soup. :-) Thanks for the comment. I don't make squash enough - because I hate the prep. (The peeling and the cutting.) But this is so perfectly spiced I'll just have to go to my zen place and do it! Hi Claudia, peeling squash is no fun! But once you roast it, the peel comes off without too much work (and usually no cutting -- I can peel it off with my fingers; or just scoop the pulp out). Thanks for the comment. I love a good roasted spicy squash soup! And love that y'all added potatoes to this! Delicious! Hi Shashi, the potatoes add such nice body to this! They pair so well with squash. :-) Thanks for the comment.